You spoke, and we listened! Starting in mid-May after the semester ends, the primary search box on our homepage will present your top results in categories organized by format, with links to dive deeper into your results. Starting now you can try it out in a “beta release”: http://library.uncw.edu/search_randall and give us your feedback! We have also switched our aggregated article searching from WorldCat Local to Summon for a better searching and linking experience. Visit our Summon Help page for more information, or watch this tutorial (COMING SOON). We will be holding two focus groups to get your input on Monday April 27 and Tuesday April 28th, both from 2-3pm in RL#1039. Please RSVP by Friday April 24th to Laura Wiegand (wiegandl [at] uncw.edu). Refreshments will be provided. Stop by Randall Library #1022 on Monday April 27th anytime between 3 - 5pm to try it out and give us your feedback in exchange for snacks and vouchers for coffee! Try a search http://library.uncw.edu/search_randall and give us your feedback! 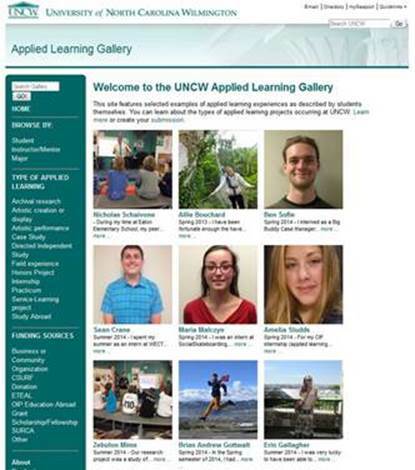 Created in partnership between Undergraduate Studies (ETEAL, Honors / CSURF, OIP, CTE),Randall Library, and the Career Center,the purpose of this gallery is to highlight exemplary applied learning projects taking place at UNCW. The site features selected examples of applied learning experiences as described by students themselves. It is intended to be a long-term effort that will grow with new additions over the coming years and will include archival capabilities for looking at the great applied learning activities of our students in a searchable database. It is also fully searchable by keyword allowing you to dig deeper into submissions. It has been designed to be mobile-friendly. Students, in addition to providing a comprehensive description of their experience, can upload presentations, images, PDFs and other materials created as part of their applied learning experience through our online submission form. Submissions will be reviewed periodically for addition into the gallery based on completeness and quality. Submissions will be solicited through the various department chairs and directors. 3 New Low-Tech Group study rooms are now available! Three rooms formerly used for media viewing have been turned into low-tech group study rooms. These rooms are designed for small groups who do not need technology and are looking for a quiet place to work and study alongside fellow classmates. The new group study rooms —RL2031, RL2033, and RL2035— are located behind the Graduate Study Room. Click here for a map of Randall Library's second floor. Group Study Rooms are first come first serve but groups of 2 or more and reservations are always given priority. View the detailed policy or follow this link to reserve a group study room. Randall Library supports the mission of the University by providing information resources and learner-centered services and by cultivating a rich physical and virtual environment dedicated to the open exchange of ideas and an information-literate community. Access to our library catalog and online library resources, such articles, journals and ebooks, will be unavailable on Saturday April 11, 2015 from 11pm until 3am EDT because of scheduled system maintenance. We apologize for any inconvenience, but the maintenance will help ensure reliable services. …an exhibit for our 2015 Flash Nonfiction Contest. Please visit the Flash Nonfiction exhibit in the gallery outside of the RL Auditorium. The exhbit highlights the winning stories from this year's contest as well as accompanying illustrations designed by UNCW Graphic Design Students. These illustrations will appear alongside the 13 selected flash nonfiction pieces in a forthcoming anthology desgined and published by the UNCW Publishing Laboratory.